Sarah is excited to announce her forthcoming exhibition ‘Thoughts And Prayers’ at Untitled Space. In her usual provocative style, the show is a mixture of old and new work reflecting on current affairs with tongue in cheek satire. 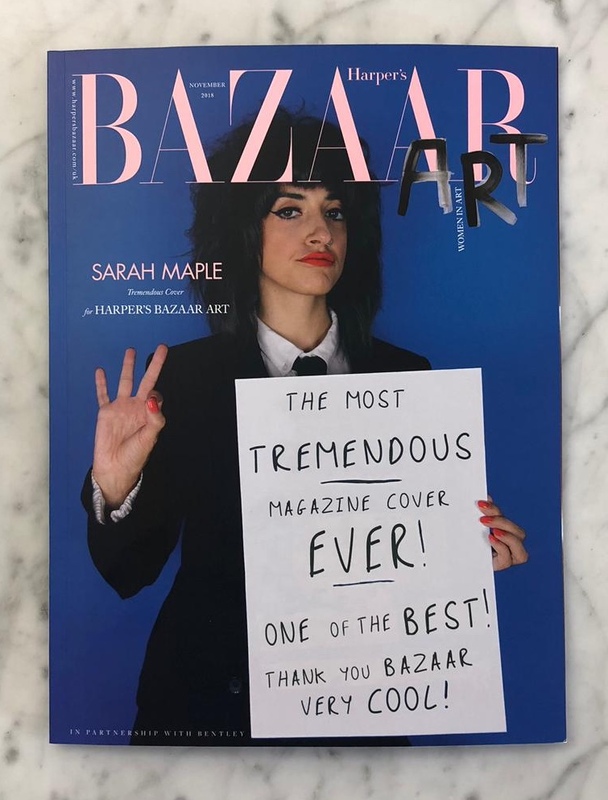 Sarah has been invited to design a limited edition cover for Harper’s Bazaar annual art issue, celebrating women in art and the launch of the inaugural Bazaar Art Week. Her cover is alongside 7 artists such as Yayoi Kusama, Barbara Kruger, Linder Sterling, Njideka Akunyili Crosby and Heather Chontos. The November issue of the magazine is available now. Sarah was delighted to deliver a talk at Birmingham Hippodrome for TedxYouth@Brum on the importance of free speech. Her talk 'The Freedom To Be Challenged' is now available online. Sarah is delighted to announce an exhibition of newly commissioned works for New Art Exchange this August. 'Not My Cup of Tea' explores timely questions around integration, the meaning of 'British Values' and the current worldview of Islam. Through satirical humour, the exhibition addresses the sharp rise of xenophobia and Islamophobia since 2016, as well as how certain communities are othered and alienated in political narratives, thus effecting public opinion. The exhibition is supported by Sky Academy Arts Scholarships and Arts Council England. No Place to Call Home is a city wide series of performances and interventions throughout Oslo. The project asks artists to explore the many different forms of homelessness in contemporary society on both a micro and macro scale. As the conditions for homelessness are rife and we are at a point in time where the rise of the right informs the media's reaction to worldwide events, allows countries to put up barriers and tear down affordable housing in exchange for luxury penthouses, the project aims to act as a momentary pause for reflection. In her new performance, A Man’s House Is His Castle, Sarah will walk through the centre of Oslo whilst carrying a large cumbersome cardboard castle. Starting outside Deichmanske Library in Grünerløkka and taking several stops on the way, she will end her journey at The Royal Palace. The act of moving a castle, symbolic of home, aims to mirror the current status of our displaced and homeless people in the world today. KochxBos invites you to take part in a radical get together where you can share your positivity and revolutionary ideas in collaboration with Sarah Maple. The gallery is becoming an inclusive space for debate, creation and interaction between you, your friends and the artist in residence. Bring along your good vibes and wildest ideas to create a positive art movement. 1 - 15 February, every day except Sunday's, 12-16 o'clock. have a drink and enjoy ! Sarah is proud to announce the Irish premiere of her film 'Keeping Up With The Kapulets' at Belfast International Arts Festival. The work created in 2014, sees actors in full period costume recreate an episode of 'Keeping Up With The Kardashians', word for word, in the context of a classic Shakespearean theatre production. The work will be screened from 14-29 October 2016 and has free entry. Sarah is delighted to be taking part in 'The Practising Feminist' at Tate Britain on 21st May as part of the exhibition 'Conceptual Art in Britain 1964–1979'. This event, which fuses conversation and contemporary practice – will explore questions such as: How have pioneering conceptualists such as Margaret Harrison influenced younger generations of artists? Can we conceive of a feminist reading of the era? And if so, what resonance does this hold for contemporary art and artists today? After a discussion with Margaret Harrison, Tate Britain will be screening Sarah's film 'Freedom of Speech', which will be followed by a discussion panel including Rózsa Zita Farkas, Margaret Harrison, Alexandra M. Kokoli and Loraine Leeson. The Others Live section at The Other Art Fair, curated by London-based curator Valentina Fois, will showcase a new performance piece by Sarah. 'Comment is Free' invites fair visitors to interact with Sarah and leave comments on her work, which will be displayed in a curated stand of mix-media art pieces. By taking ownership of the comments, Sarah wishes to raise the question as to whether exposure to comments can help or hinder an artists work. Can too many critical comments end up silencing an artist? Or is it fuel for the fire? The performance itself was conceived as response/reaction to a recent interview with Sarah in The Guardian, which was shared over 11,000times and commented on 330 times. The article ultimately explored her experience of abuse, when in 2008 she created an exhibition inspired by feminism and her Islamic upbringing, something that was then deemed ‘offensive’ enough for some people to threaten her and her family. "In 2008 I created an exhibition inspired by feminism and my Islamic upbringing. This was deemed ‘offensive’ by some enough to throw a brick through the gallery window, and by others to threaten me and my family. After my experience of abuse, this unwittingly transformed how I worked as an artist and how I realised my ideas. Even if I thought I was strong and would not give into my abusers, the memories had subconsciously lain dormant. After the Charlie Hebdo tragedy, I began to wonder why I hadn’t spoken of Islam again and if, in some way, I had been subconsciously silenced by my abusers. Each year, Sky Academy support five emerging artists from the UK and Ireland through Sky Academy Arts Scholarships. Each recipient will receive £30,000 towards the development of an artistic project and the cost of living for one year, along with mentoring from Sky and the Arts industry. The 2015 judging panel included Godfrey Worsdale of BALTIC, Louise Jeffries of the Barbican and Kris Nelson of the Tiger Dublin Fringe. Over 1,000 applications were received and assessed by industry professionals. 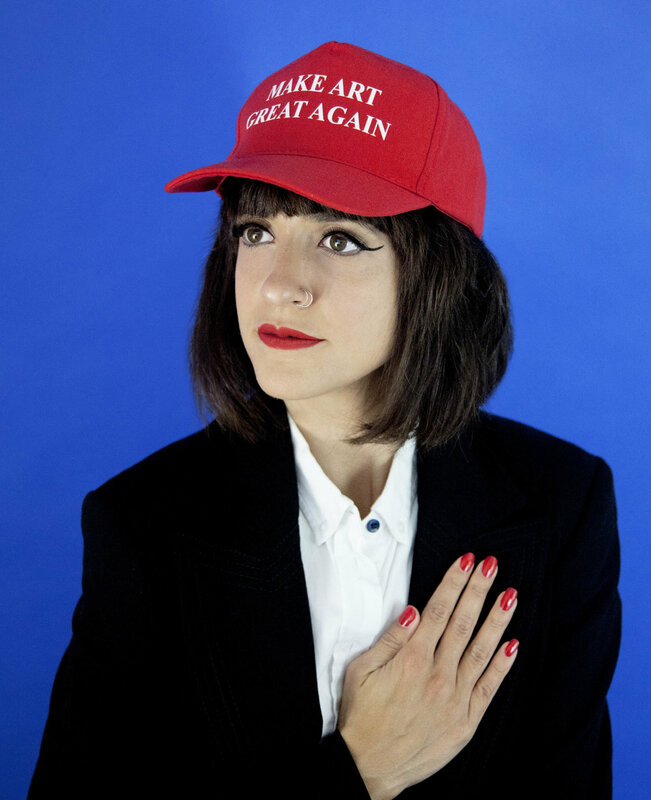 Sarah's project aims to create an exhibition of new paintings, photography and performances investigating the concept of freedom of speech.